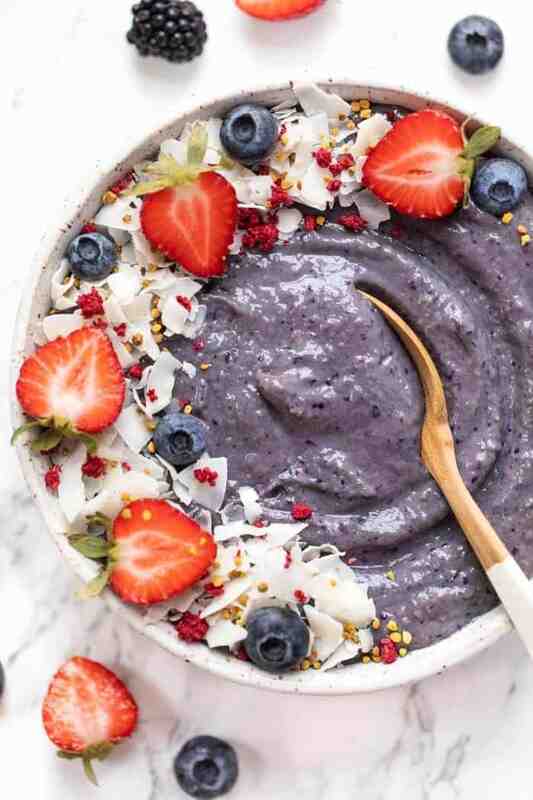 This delicious triple berry smoothie bowl is the ultimate way to start your day. Vegan, low in sugar, banana-free and packed with protein and healthy fats! My love for smoothie bowls is nothing new. I've been raving about them for years and I pretty much have one every single day. But in the last few months, I've found my favorite combination. A combination that I come back to over and over again. A combination that is nourishing, simple, just sweet enough and with the most velvety smooth texture. 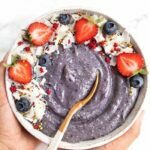 This triple berry smoothie bowl is truly the best way to start your day! The first thing we need to talk about is the ingredients. I've personally been making low sugar smoothie for the past few months and I'm obsessed. I used to think you needed to add tons of banana to get that ice cream like texture, but I've figured out you can still have a delicious smoothie bowl without using ANY high sugar fruits! It's truly that simple and it's seriously the BEST combination! There trick to a perfect smoothie bowl is getting a texture that's thick enough to hold your toppings and that you can eat it with a spoon. I don't know where eating your smoothie with a spoon started, but I am so down! 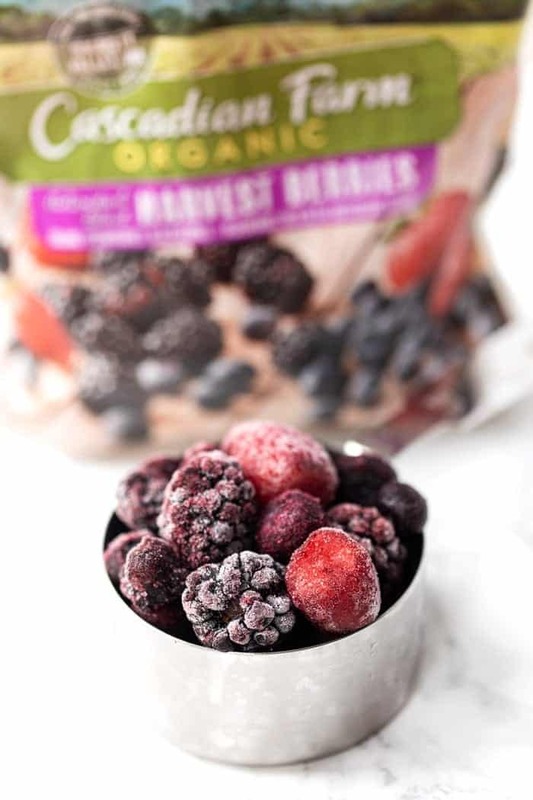 For our something frozen, we're using Cascadian Farm's Harvest Berries, which is a blend of organic strawberries, blackberries and blueberries. 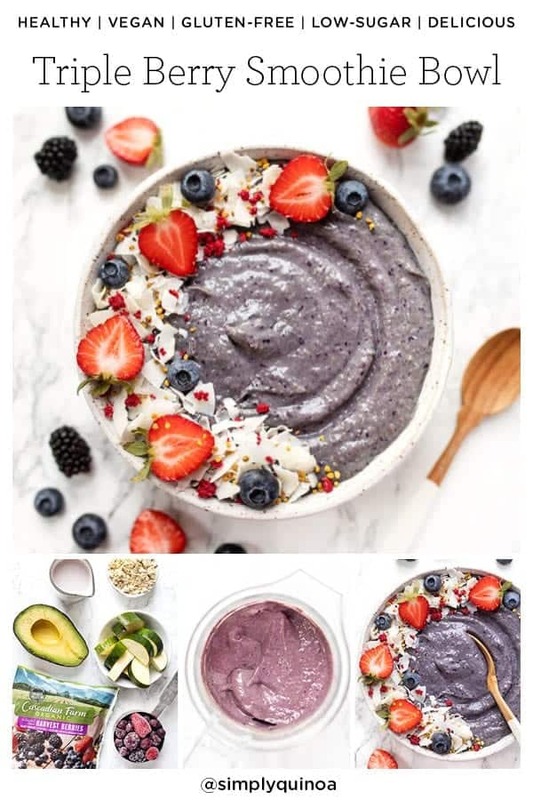 I love this blend of berries because it not only has the best color when they're all blended together, but each berry has their own flavor and bring an amazing natural sweetness to the bowl. 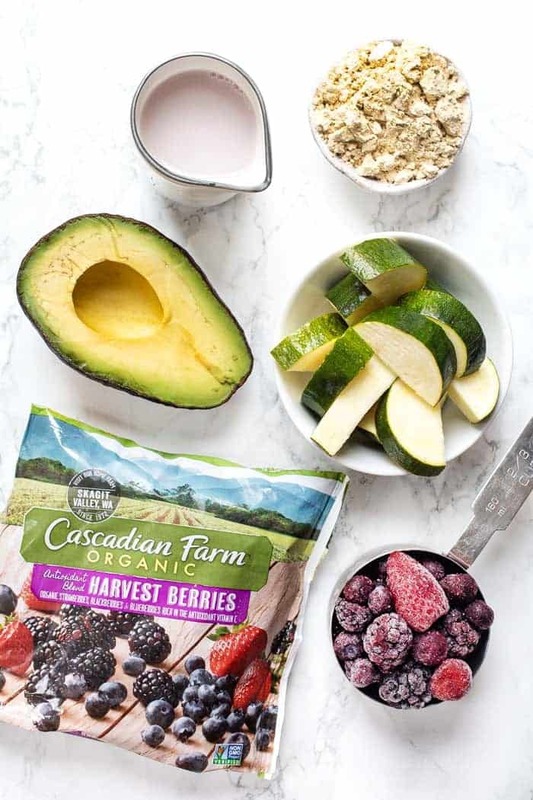 Cascadian Farm has long been my one of favorite frozen fruit companies. Their products are all organic (they've been an organic farm since 1972!) and they have a ton of amazing options that you often have trouble finding organic. And guess what? Cascadian Farm is actually a real place in Washington State AND I get to go there in a few short weeks The Feedfeed!! Make sure you're following me on Instagram to see a behind the scenes! For our something creamy, we're using a blend of fresh zucchini (you could also use frozen) and avocado. Zucchini might seem a little strange, but trust me, it's one of the best-kept secrets for making low sugar smoothies. 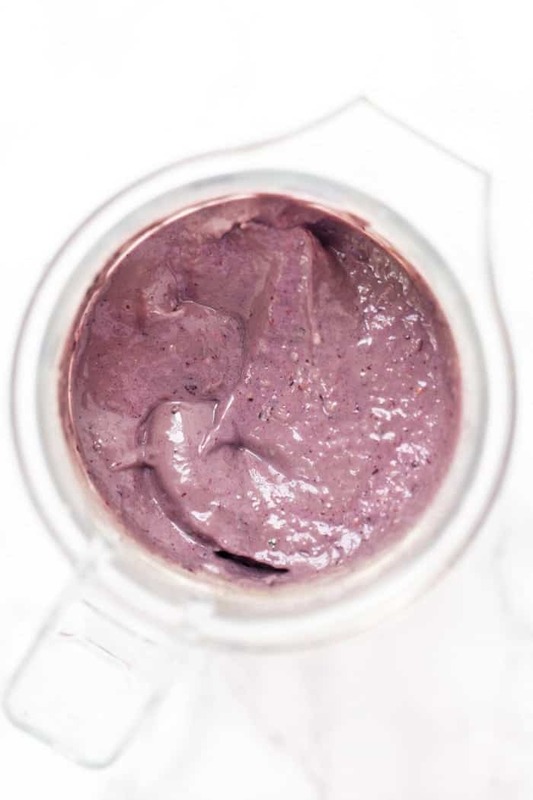 When blended, it yields an amazingly creamy texture, it has zero taste and it's another way to boost fiber in your smoothie, therefore making it more filling! And avocado? I'm sure you already know how amazingly creamy and healthy avocado is! 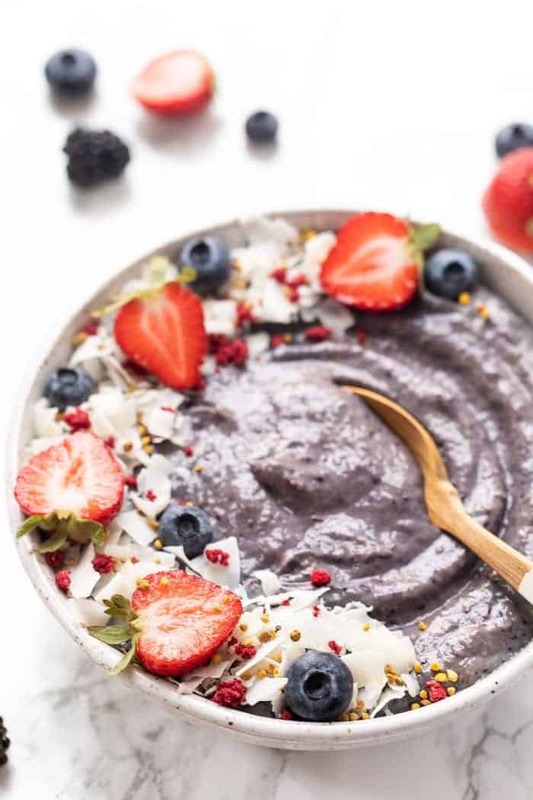 The avocado really helps make the texture of this triple berry smoothie bowl ultra velvety! For the liquid, you can use whatever you like, but don’t add too much. That’s how you’ll get a nice thick texture – I usually go with ¼ to ½ cup of liquid. 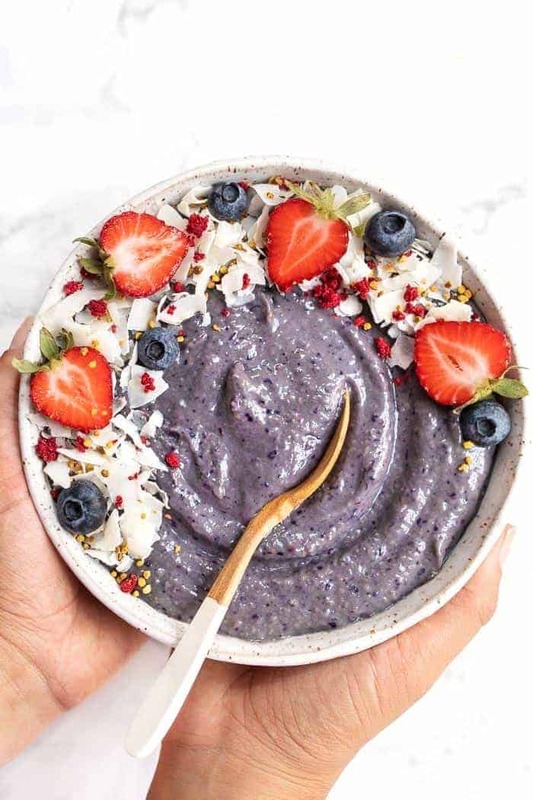 I'll be honest and tell you, most of the time my smoothie bowls do NOT look like this! Usually, I just throw everything on top and immediately start devouring it, buuuut it's actually really easy to make a smoothie bowl pretty. Make sure the top of your smoothie bowl is totally smooth. Choose your toppings! Go with contrasting colors, use fresh ingredients that are in your smoothie already and always add some crunch. Not only is this smoothie fantastic for breakfast, but it also makes an amazing post-workout meal. We have the healthy fats, the complex carbohydrates, fiber and protein. I like to add in vegan vanilla protein powder to give my smoothies a little nutritional boost, but you could totally do a few tablespoons of hemp seeds, a scoop of peanut butter or some other form of protein. Because we've packed this bowl so full of nutrients, it's going to fill you up, keep you satisfied and fuel you for the day ahead! p.s. don't forget to follow along as we tour the Cascadian Farm in Washington! I'll be sharing everything on my Instagram, so head over to my profile and make sure you're following me! 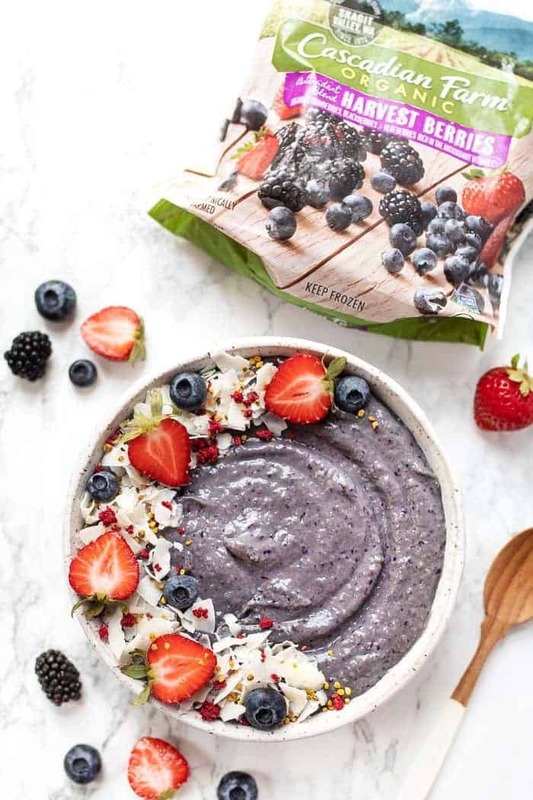 This delicious triple berry smoothie bowl is the ultimate way to start your day. Low in sugar, banana-free and packed with protein and healthy fats! Add all the ingredients into your blender in the order listed. Blend on high until smooth and creamy. Transfer berry mixture into a bowl. Smooth with your spoon and top with your desired toppings! This recipe is brought to you in partnership with Cascadian Farm & The Feedfeed. As always, all opinions are my own. I only share companies I love and trust, so thank you for continuing to support Simply Quinoa! Can I make this ahead of time and keep in the fridge overnight? Thanks! Alyssa, which protein powder fo you recomend?. I love your recipes, Thank you gor all you do for us. Thank you! I use this one: https://amzn.to/2mIYOmh — it’s grain-free and I love it!